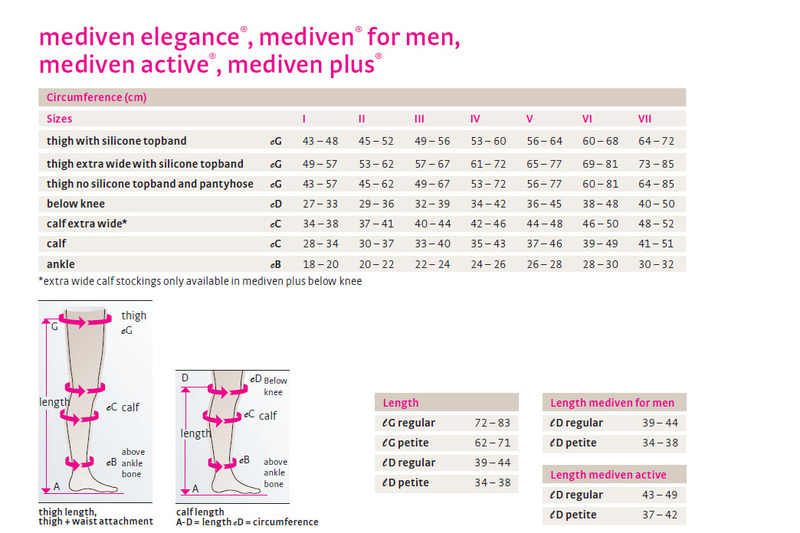 The Medi Mediven Plus Class 1 Black Left Leg Stocking with Waist Attachment and Open Toe comes from Medi, one of the UK's leading providers of compression garments. The open design of the stockings helps to create better ventilation and therefore offers protection against overheating. Helping you feel self confident, the Medi Mediven Plus Class 1 Black Left Leg Stocking with Waist Attachment and Open Toe not only provides accurate compression but is also soft, supple and hypo-allergenic. The advanced construction of the yarn ensures the Medi Mediven Plus Class 1 Black Left Leg Stocking with Waist Attachment and Open Toe is very comfortable, highly elastic, hard wearing and durable and secures with Velcro for an all-day perfect fit. Which conditions can Mediven Plus Class 1 Open Toe Left Leg Stocking With Waist Attachment Help to Treat? Medi Mediven Plus Class 1 Black Left Leg Stocking with Waist Attachment and Open Toe are non-returnable and non-refundable on grounds of hygiene.